Astorino argued Christie, who chairs the Republican Governors Association, has campaigned all across the country for other GOP candidates and could easily come "across the bridge" to support Astorino. "Unless he is unable or unwilling because he has an issue that we don't know about with Andrew Cuomo and the bridgegate scandal," Astorino said in an interview with Fred Dicker on WGDJ-AM. "And if that's the case and he feels he can't do it, then maybe he should step down as chairman because his role is to raise money for Republican candidates," he continued, though he did not say what he thinks Christie and Cuomo may be holding back. His campaign also did not give any specifics when later asked by CNN. While campaigning for a gubernatorial hopeful in Connecticut on Monday, Christie was asked whether he'd do the same for Astorino. 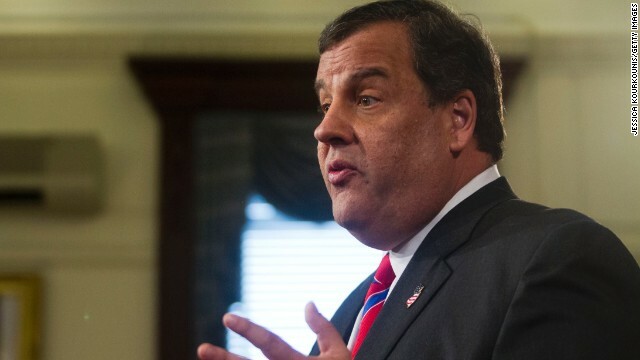 The New Jersey governor said the RGA doesn't spend money on "lost causes." "We don't pay for landslides and we don't invest in lost causes," Christie said, according to NJ.com. A Siena College survey released Monday indicates Cuomo is easily poised for re-election and holds a 37 percentage point lead over Astorino. And Cuomo led Astorino by 35 points in a recent Wall Street Journal/NBC 4 New York/Marist survey. "These polls mean nothing," Astorino said Tuesday, attributing the numbers to his low name recognition and arguing that it's too early to accurately gauge support. "A lot can and will change in the next three and a half months when voters start paying attention." Christie's office had no comment on Astorino's latest remarks. The governor's administration is under investigation by the U.S. Attorney's Office in New Jersey, as well as a state legislative panel, after aides orchestrated the closing of access lanes to the George Washington Bridge last September out of apparent political against the mayor of Fort Lee. Christie let go of the aides involved and has long maintained he had no knowledge or involvement in the plot. One of the aides worked at the Port Authority, a bi-state agency run by New York and New Jersey. Probes by Christie's administration and by the state legislature have also not found evidence that Christie was part of the lane closures. That's a polite way of putting it. A 37 point margin does look like a lost cause in anyone's eyes. I can't blame Christie for not supporting Astorino. Astorino is in his own political death spiral. Didn't Christie pay millions extra to hold a second election so that he wouldn't be on the ballot with Booker? He wanted a landslide that he likely would not get had Booker been on the ballot with him. So yes, you do pay for landslides! Sounds like sour grapes. While you should try to support fellow Republicans, pumping money into these lost cause blue state quagmires of democrat wreckage and ruin just makes no sense. It is just better to let the Democrats complete their destruction as they are doing in Chicago and Illinois. Border Sheriffs Perplexed by Rick Perry's Plan to Send 1,000 Troops to Stare at Mexico ? Not a bridge too far , nor a border too long ! "these lost cause blue state quagmires of democrat wreckage "
You mean donor states... the states which are so successful they pay to keep the red (taker) states from starving to death. You have a funny way of looking at things. My child (at 5y/o) used to call this 'Opposite Day'. Christie is simply being practical. NY, which has been assimilated into the anti-American collective, will vote Dem, no matter who is running. Wasting money on a candidate who is at best, a distant long shot, is not being practical. Keep dreaming. Over the last 10 years, Texas created 33 percent of the net new jobs nationwide.